Yeah, I know. I'm always going to Bangkok. But with cheap fashion apparels, cheap (and good) food and tons of interesting cafes, why would you not return to this sweltering hot land of smiles? As we're traveling in a pretty large group of 5, and yet not that willing to accommodate to the non-standard check in/check out time from certain airbnb apartments, we decided to go 'budget' for our accommodation just so we can all squeeze into 1 room. 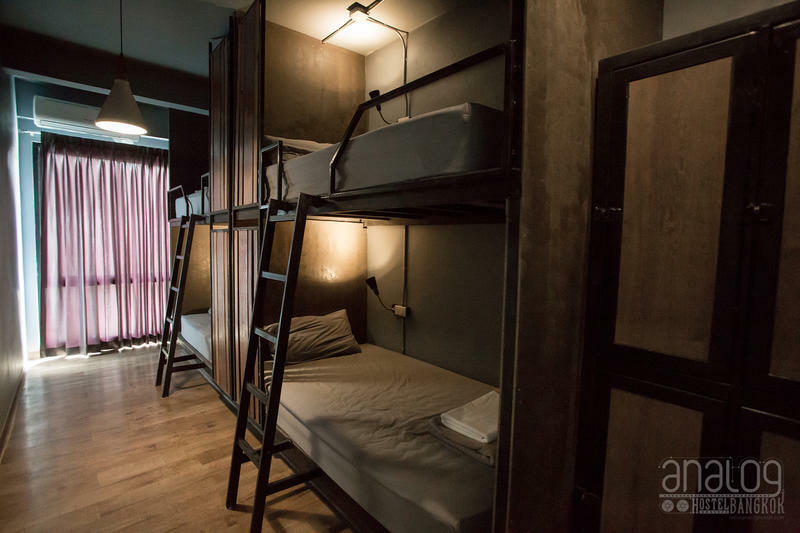 After some searching online, we chanced upon Analog Hostel, which looked as good as any other boutique hotel and also has a 6-bedder private room with ensuite bathroom available. 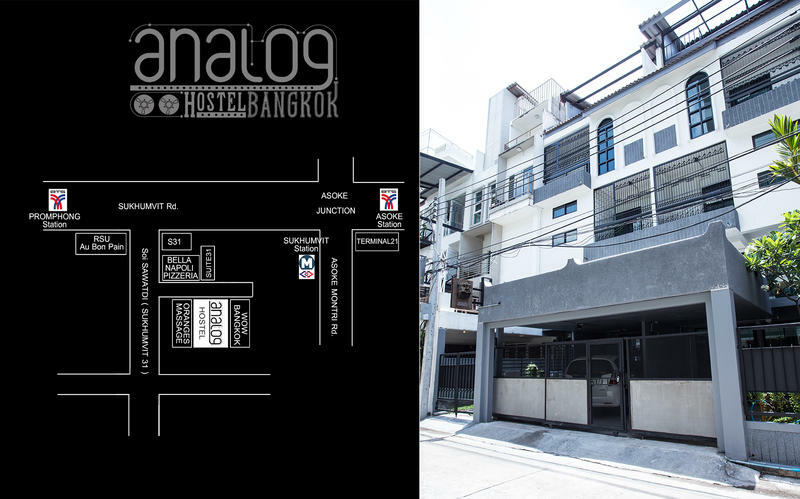 Analog Hostel is located in Sukhumvit area and just 5 to 10 minutes walk from Phrom Phong BTS or Asok MRT, right behind Sukhumvit 31. Locating it for the first time might be a little tricky as it's seated in the small alley with no obvious signboard, and even Google Map wasn't able to give us a very accurate direction (It kept prompting that we've arrived when we're at Sukhumvit 31). To get to Analog Hostel, walk past Sukhumvit 31 and further down until you see the flashing signboard of a pizza restaurant and turn in at the signboard of Oranges Massage. Analog Hostel is right beside the massage parlour. There's tons of cafes and restaurants in the vicinity, along with convenience stores ( 7-11 and Family Mart) and even a supermarket that littered the streets around the hostel, so you need to worry about food at all. For a little more luxurious shopping experience, there's also Terminal 21 (with Wacoal, Jelly Bunny etc) at Asok MRT and EmQuartier (with Uniqlo, Zara etc) at Phrom Phong BTS and a Naraya shop right across the street from EmQuartier. As if all these are not enough, the ever so popular restaurant on IG, Karmakamet Diner and the hippie night market, Artbox (now closed), are all within walking distance in between Phrom Phong BTS and the hostel. There's also a cheap and decent massage parlour, Manja (green signboard) right outside. 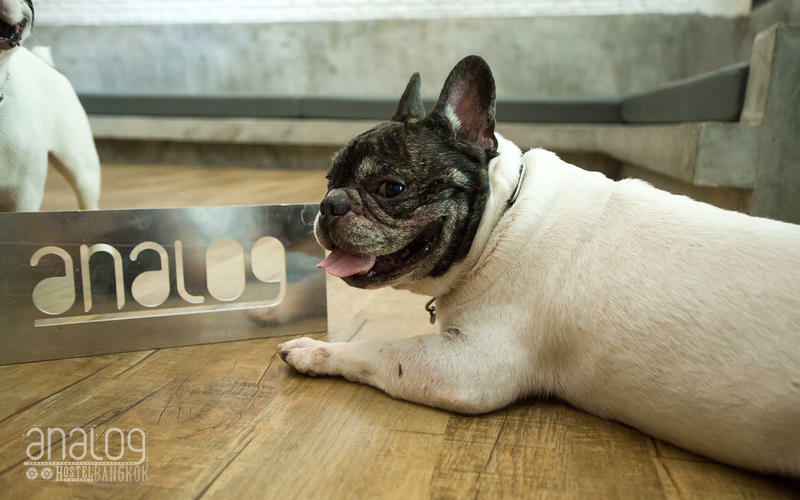 Best of all is, there's two resident French Bulldogs housed at the lobby to greet you when you arrive! If you're terrified of dogs, there's no need to worry as these two cuties are housed inside the reception counter and not free-roaming around the hostel. There's also a TV set at level 2 for you to watch some TV programs. I'm not sure about the channels available though. Our room was just awesome with 3 sets of bunk bed and 6 individual lockers. The bed is extremely comfortable and every bed has a night light and electrical point for you to charge your electronic devices. The room opens to a veranda with a wash basin and links to a pretty big bathroom with standing shower. Towels, basic toiletries (shower gel and shampoo) and a hair dryer is also provided. I would say everything about this hostel was great, except for the fact that they do not have a lift, and our room was on the 5th floor! Given the fact that most of us ladies travel to Bangkok to either buy back the whole Platinum Mall or Chatuchak Market, this was really a bit problematic for us, especially for our return (lugging all our belongings down 5 stories). But then again, we survived and given the chance to travel to Bangkok in 5s again, I would probably choose Analog Hostel once again. For booking of Analog Hostel, visit booking.com, hotels.com, agoda.com or expedia.com for better deals! Love it! Such a cool place to stay.. I love how they have used all these antique things to give a trendy look! I want to return to Bangkok with my sister just for shopping. Analog Hotel looks okay and it's great that restaurants are very much accessible in the area. The hostel looks nice, although climbing five flights of stairs was a bit of a letdown, but I wouldn't mind if I get an affordable, cozy place to stay like this. That was also what I experienced when I went hostelling in Singapore. Climbing the stairs was not the fun part, too. It looks good for economy stay and temporary sheltering in other place like Bangkok. I observed, the TV and old typrwriter...I think, it's so classy as other hostel. But financially affordable and easy way to the city proper. Since I usually travel with my whole family, this may not be the best choice. This is ok maybe if I was only travelling by myself. It is really good way to write blog. You seems tourist guide! This is looks like your favourite hostel. I also lived in some hostel on my education time and I have gone through its difficulties and adjustments. I am telling this because your writeup pushed me to remind my history. Have a great day! 6 bed ensuite in budget itself sounds good. At budget if they provide towels & toiletries, it is definitely something!! The dog looks so cuuuuute. And the facilities look elegant. I love it! The place has a nice location, which is accessible to food and transport places. They also have a really cool ambiance and homey feel. It sounds like a great place to stay in especially if you're traveling in a group of 5 or more. The common area is very lovely, it gives you that "home" vibe. It's just that, I wish they have an elevator too, it could be tiring to climb the stairs after touring and shopping. I like this hostel, it has all the basic things that we need. Plus the hostel look clean and neat also. This hostel looks decent place and if with friends then surely will be fun. #FitnessWednesday - What's Your Body Type?